A study conducted in Niger in the fall of 2010 documented a 50 percent drop in mortality among young children who received a milk-based, fortified spread, compared to those who did not. For MSF, this very encouraging outcome is yet another reason why complementary food—suitable for the requirements of young children—should be systematically integrated into programs that aim to reduce infant mortality in countries where the toll of malnutrition is highest -- just as immunization has become a part of a minimum health package for young children. Over the past several years, a scientific consensus has emerged on the importance of a balanced, complete diet in preventing a deterioration of nutritional status among young children. At the 2010 G8 Summit in Muskoka, Canada, member states agreed to focus their efforts on reducing infant mortality by two-thirds between now and 2015. To achieve this goal, G8 members who figure among the principal donor countries should also fund programs that undertake quality nutritional measures for the most vulnerable children. MSF is now asking these countries to make age-appropriate food for young children one of the pillars of infant mortality reduction programs. During each year’s “lean season,” which extends roughly from June to October, Niger faces recurrent food and nutritional crises that vary from year to year only in intensity. In 2010, the crisis was particularly intense. Low rainfall resulted in an inadequate harvest in 2009, amid an already fragile food security situation due to increasing food prices over preceding years. In April 2010, approximately half of the country’s population found itself in a moderate or severe food security situation. In June 2010, a survey conducted by Nigerien officials estimated that approximately one out of every six children was, or would soon be, suffering from acute malnutrition. Among children between the ages of six months and two years, the ratio was one child out of every four. In the Maradi region, in the country’s south, up to four percent of all children under five years of age were suffering from the most severe form of malnutrition, thereby exposed to a high risk of mortality. In 2010, Nigerien officials, the United Nations, and local and international NGOs implemented a historic crisis response plan. Over 300,000 children suffering from severe acute malnutrition were successfully enrolled in nationwide therapeutic feeding programs. Four times more children were targeted than in 2005, when Niger was struck by a food crisis of greater magnitude. Furthermore, food distributions intended to prevent the onset of malnutrition among the most vulnerable were given to approximately 675,000 young children, which amount to almost one third of all young children in Niger. About 500,000 of these children are estimated to have had access to at least one or two distributions of food adapted to their needs. The foods provided quality protein and other essential nutrients, setting another encouraging precedent. Nigerien authorities and aid agencies are planning to continue these prevention programs in 2011, targeting approximately 500,000 young children. MSF and its Nigerien partners contributed to a response plan drafted by Nigerien officials. One hundred and fifty thousand severely-malnourished children were treated, roughly half of all malnourished children treated nationwide. Nutritional supplements were provided to approximately 150,000 additional children, mostly between the ages of six months and two years. At the peak of the crisis, MSF and its FORSANI (Forum Santé Niger) and ALIMA/ BEFEN (Bien-être de la Femme et de l’Enfant au Niger) partners mounted interventions in 64 ambulatory treatment centers (AFTC) and 9 hospital facilities, in the regions of Tahoua, Zinder, and Maradi. Between 80 percent and 90 percent of the 150,000 severely-malnourished children admitted to these facilities, of which 24,000 were hospitalized, were successfully treated. Starting in July 2010, distributions of ready-to-use supplementary foods (RUSF) were organized by MSF and FORSANI in five districts of Tahoua, Maradi, and Zinder. In the first four districts, all children between six months and two years of age received rations (four 325 gram jars: three tablespoons of food supplement per day) of ready-to-use supplementary food (RUSF), distributed each month after the children were registered at the start of July. In the district of Mirriah, the number of beneficiary children was re-calculated each month, according to arm-circumference, and each eligible child received a month’s ration of a high-calorie ready-to-use supplementary food (30 92 gram packets: one packet per day). In addition to addressing young children’s nutritional status, MSF also offered free health care for children under five years of age. In 2010, MSF and its partners treated more than 215,000 cases of malaria among children under five and provided care for 13,000 children who were admitted to hospital. An observational cohort study was conducted by Epicentre, MSF’s epidemiological research center, in three of the five intervention districts (Guidan Roumdji and Madarounfa in the Maradi region, and Mirriah in the Zinder region). The cohort was composed of a total of 3,432 children in 10 villages and hamlets in each district: 1,938 children received at least one distribution of nutritional supplements;1,494 did not. The choice of villages and hamlets was made in order to obtain a representative sample of the entire district. First, the villages were divided according to two parameters: accessibility/infrastructure (presence of a health center and a market, proximity of a modern water point); and administrative status (village or hamlet). A random selection of villages, according to population size, was then made from within each group. Two weeks following each distribution carried out by MSF and its partners an Epicentre team conducted individual follow-up on all the children between six months and two years (three years for Mirriah) in the villages. All children in the observational cohort live in districts where MSF operates medical activities to improve access to free health care for common pediatric illness, including malaria. Each month, all children in the cohort were screened for severe acute malnutrition and identified cases were treated in health centers supported by MSF and partners. 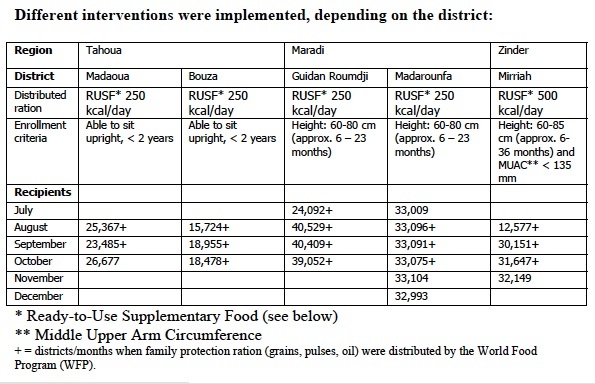 For the first objective, stabilization of nutritional status was observed for the recipient children in Mirriah district (they received the supplement providing 500 Kcal/day), whereas the changes in nutritional status were not significantly different among children in Guidan Roumdji and Madarounfa districts (who received nutritional supplement of 250 Kcal/day). However, it is quite clear that the mortality rates among children who received the nutritional supplements were lower, regardless of the amount of supplement received. In the district of Madarounfa, mortality among the distribution program’s recipient children was 2.2 deaths per 10,000 children per day, versus 5.3 deaths per 10,000 children per day among those children who had not received the products. In Mirriah, in the Zinder region, and in Guidan Roumji, in the Maradi region, these rates were 1.2 versus 3.2 per 10,000 children per day, and 1.1 versus 2.5 per 10,000 children per day, respectively, for children between 6-23 months old. Epicentre conducted a complementary study on the mothers of recipient children in order to document the use of the nutritional supplements. Questionnaires were given to 1,842 individuals in charge of preparing household meals in four villages in the districts of Guidan Roumji, Madarounfa, Madaoua, and Mirriah, and interviews/group discussions were conducted with the persons in charge of the children receiving distributions. However, this sharing took place mostly among children under five in the same household (in 85 percent to 97 percent of cases, the product was shared among children under five years of age), a sign that the product is identified as a food for children. Nutritional supplements have a name in Hausa, the most widely-used language in the south of Niger: abinchi n’yara, or “children’s food.” This is a good indicator of efficacy as mothers direct these nutritional supplements to the younger children, rather than re-distributing them widely; sharing of food within households and the community is one of the coping strategies during an acute food crisis situation. Malnutrition is not solely the result of inadequate quantities of food; it also results from monotonous, unbalanced diets lacking in the nutrients essential to children’s growth and to proper functioning of their immune system. An inadequate diet has the effect of weakening children’s immune defenses against the most common diseases. This is why diarrhea or a malaria episode can be fatal to a malnourished child. The ratio between a child’s weight and height and/or his middle upper arm circumference is the presently-used indicator to define a state of acute malnutrition, or wasting. But even before this ratio drops below the threshold for acute malnutrition, micronutrient deficiencies can lead to a degradation of the immune defenses, thereby posing an increased risk of death due to common diseases. In MSF’s feeding programs in Niger, up to 85 percent of children admitted for severe acute malnutrition are under two years of age. Year after year, the countries of the Sahel are confronted with recurrent food and nutritional crises. Even though the recent introduction of home-based treatment of malnutrition using ready-to-use therapeutic foods has dramatically increased the number of children being treated, the present mortality rate in the best feeding programs remains around five percent. It is therefore necessary to intervene earlier, before children find themselves in a critical state and exposed to an elevated risk of death. To this end, in 2010 MSF and its partners in Niger implemented a package of care including preventative activities based on distributions of nutritional supplements, during and after the most difficult periods, in order to lessen the impact of malnutrition, and, therefore, infant mortality. Breast milk is the only food that babies need in the first six months of life. Thereafter, it is no longer sufficient, and the choice of complementary food incorporated into an infant’s diet becomes critically important. In the absence of a balanced diet, a child will develop essential micronutrient (minerals, vitamins) and protein deficiencies, and will descend into a state of malnutrition. In numerous developing countries, particularly in the farming areas of the Sahel, quality complementary foods (animal-sourced foods) are often not available or accessible. This phenomenon is accentuated during the annual “lean season,” the period of time between the exhaustion of household food reserves and the next harvest, as well as during food crises, which make household access to food even more difficult. This is why it is so important to provide quality complementary foods—added to breast milk and household meals—that provides children with everything they need. Over the past few years, new nutritional supplements for young children have been developed. These products, simple to use and able to be consumed at home, now allow us to contemplate long-term, large-scale interventions. Ultimately, these interventions could be incorporated into the routine activities of national health systems, such as immunization programs. The products distributed in Niger by MSF are called Ready-to-Use Supplementary Food (RUSF), also known as Lipid-Based Nutrient Supplements (LNS). These are peanut-based pastes that contain powdered milk or whey, vegetable oils, sugar, and all the micronutrients (mineral and vitamin) necessary for the development of a growing child. Even though they share a similar formulation, these foods are different from Ready-to-Use Therapeutic Foods (RUTF), which are used to treat cases of severe acute malnutrition. RUTFs are formulated to provide 100 percent of the energy and nutrient needs to a severely malnourished child during a recovery period. Because they provide for all of the nutrient needs, RUTF formulations are universal. RUSFs, on the other hand, provide a complement to breast milk and family foods. Thus, their formulations in energy, proteins, vitamins and minerals must be determined by age group and overall diet. The RUSFs used by MSF in Niger have been developed according to the typical needs of a young child growing up in the Sahel. Other foods are used today in malnutrition prevention programs around the world: in particular fortified blended flours, the most common of which is Corn-Soy Blend (CSB). Fortified blended flours, which have long been the most widely-used form of nutritional supplement within the context of food aid, are considered by most experts to be unsuitable for feeding young children or children with moderate malnutrition. They do not deliver all of the micronutrients in amounts (minerals and vitamins) essential for young children, and do not have the animal or milk protein essential for their growth. This fact has been widely acknowledged, resulting in a revised view of their quality. The World Food Program (WFP) is working to improve these supplements and is revisiting their composition. It is developing recipes intended for young children, which include milk powder, and improved mineral and vitamin content. Compared to enriched flours, ready-to-use products have several advantages when used on a large scale, particularly in the Sahel environment: simplicity of use; consumption without preparation; and good storage capacities. Furthermore, they can be produced in the countries and regions where they are used. 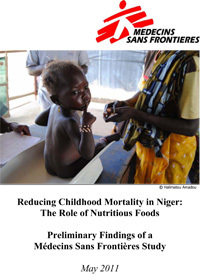 Results of the study conducted in 2010 have confirmed for MSF the importance of including nutritional supplementation in programs aimed at reducing infant mortality in those countries where malnutrition is endemic. As part of an intervention to reduce mortality among young children, it is necessary to prevent malnutrition and the nutrient deficiencies that weaken their immune system, and thereby increase the risk of developing the “killer” diseases of childhood (particularly malaria, respiratory injections, and diarrhea). The intake of adequate complementary food, therefore, represents a necessary but not sufficient condition for an effective pediatric program in the Sahel, in the same way as immunization activities, access to free health care, or even early screening for and prevention of malaria, among other factors. Over the past several years, a scientific consensus has emerged on the importance of providing suitable food for growing children in those countries where the toll of malnutrition is highest. For MSF, it is important for this consensus to now translate into increased funding allocated for these measures. In 2010, the World Health Organization began establishing guidance for supplementary food formulations aimed at preventing moderate malnutrition. Main aid agencies, such as UNICEF and the WFP, have begun similar initiatives and are including quality, age appropriate food supplements in their programs for young children. Although a few of the main donors, USAID and ECHO in particular, have recently provided financial support to some of these pilots, addressing the nutritional requirements of intended beneficiaries has yet to become a criteria for allocation of funds to nutrition programs. Despite the encouraging advances, international food aid continues to be largely comprised of enriched flours that contain no milk. As such, they remain ill-suited to the needs of young children. However, programs that include a nutritional component have made it possible to significantly reduce levels of malnutrition and mortality in Europe, the United States, and even South America. These same countries should today foster conditions in which food of an equivalent quality is available for the children of Niger and other countries where the prevalence of malnutrition is high. At the 2010 G8 Summit in Muskoka, Canada, Member States declared their wish to increase efforts to attain Millennium Development Goals Four (reducing under-five mortality by two-thirds by 2015, compared to 1990 levels) and Five (reducing maternal mortality by three-fourths by 2015, compared to 1990 levels). To this end, the G8 states have agreed to provide additional funding (as much as five billion dollars) to programs capable of having an impact on maternal and child health. At the next G8 summit, taking place May 26-27 at Deauville, France, Member States will conduct a review of the state of progress of the Muskoka Initiative. In parallel, as part of the “Partnership for Africa,”* an inventory of outcomes and good practices in the continent's health and food security sectors is also planned. MSF is calling on Member States to seize the opportunity to make age-appropriate nutritional interventions one of the pillars of efforts to reduce infant and young child mortality. See Jean-Jacques Bertrand, chairman and CEO of Aventis-Pasteur, and chairman of the Syndicat national de l’industrie pharmaceutique (Bertrand, 2000).